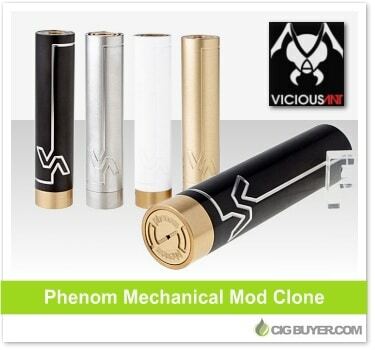 In our opinion, the Phenom Mod by Vicious Ant is one of the most stunning and attractive mechanical mods this year; especially the “Dark Version” in black. Constructed of stainless steel with an adjustable brass contact, the VA logo is incorporated subtly into the design and gives it a clean, high-end look. It takes a single 18650 battery and has a bottom magnetic firing button with lock ring that is said to be exceptionally smooth.